Earlier this month, TPG Travel Editor Melanie Wynne wrote about the top 10 hotel club lounges in the U.S., along with tips for getting access. Today, TPG Contributor Nick Ewen takes that list abroad with his look at 10 international hotel lounges that will bring your future hotel stays to a new level. If you’re a road warrior like me, chances are you’ve seen the gamut of club lounges in the U.S. Some are spectacular, while others disappoint. While lounges beyond our borders can be just as hit or miss, many international hotel clubs do step up their game. So today I want to show you some of my favorite international hotel club lounges out there to help you figure where to stay on your next trip abroad. This won’t be a comprehensive list, nor will it be a quantitative analysis. There are too many variable to make a practical ranking of these locations. Also, amenities vary across brands, but also within them; what you find in one Conrad hotel, for example, may differ significantly from other Conrad locations. We begin with one of the foremost luxury hotels in a city full of them: the Four Seasons Hong Kong. Located in the heart of the central district, the hotel is just a short (covered) walk from the Airport Express stations. It boasts an impressive lounge called the Executive Club on the 45th floor. Open 24 hours, the club provides sweeping views of Victoria Harbor from the floor-to-ceiling windows or wraparound balcony. You can also enjoy an astonishing array of included services. A full breakfast buffet is served from 6:30 – 10:30 (7:00 – 11:00 on the weekends and holidays), with the standard continental items, rotating hot dishes, and cooked-to-order eggs. Afternoon tea is served from 3:00 – 5:00, and a “light” supper buffet (including a noodle bar) and cocktails are served from 5:30 – 8:30. You can also enjoy complimentary drinks from 11 am to 1 am, free garment pressing services (up to 6 per day! ), and a free hour of boardroom access per stay. You could also book rooms on the club level (floors 37-43), with premiums of HKD 1,700 – 1,900 (US$219-255) per night over the standard room. Club access is included when you book suites, though January prices for these rooms start at HKD 10,800, or almost US$1,400! Finally, this hotel is a part of Amex Fine Hotels & Resorts, so if you have the American Express Platinum card, you could take your chances of getting a club floor room with the included upgrade benefit. Just be aware that there are two categories of non-club rooms above the standard room, so getting the right upgrade would be a crapshoot. 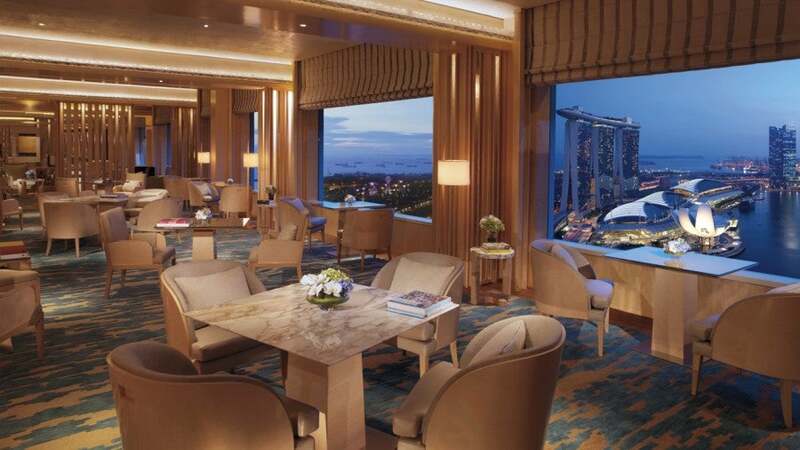 Another luxury hotel with a terrific lounge is the Ritz-Carlton Singapore. Located on the 32nd floor, the Club Lounge is open from 7 am to 11 pm, and is almost a culinary destination by itself. With five daily food & drink presentations, including Champagne breakfast, light refreshments, afternoon tea, hors d’oeuvres and cocktails, and dessert & cordials, you could wind up taking all of your meals there while enjoying spectacular views of the city skyline. As a club level guest, you can also use the library for business meetings (up to 10 attendees), take advantage of complimentary garment pressing (up to five items upon arrival), and utilize the complimentary limo service for short trips in the vicinity of the hotel (subject to availability). How to access: Standard rates in January start at 390 SGD per night (approximately US$295), and club rooms appear to be a standard 180 SGD (US$136) higher per night. Unfortunately, this particular property does not participate in the Ritz-Carlton and Marriott Rewards programs, though it is a participant in the Amex Fine Hotels & Resorts program. Again, there are two room categories between the standard deluxe room and a club level room, so you’d be taking your chances with an upgrade. 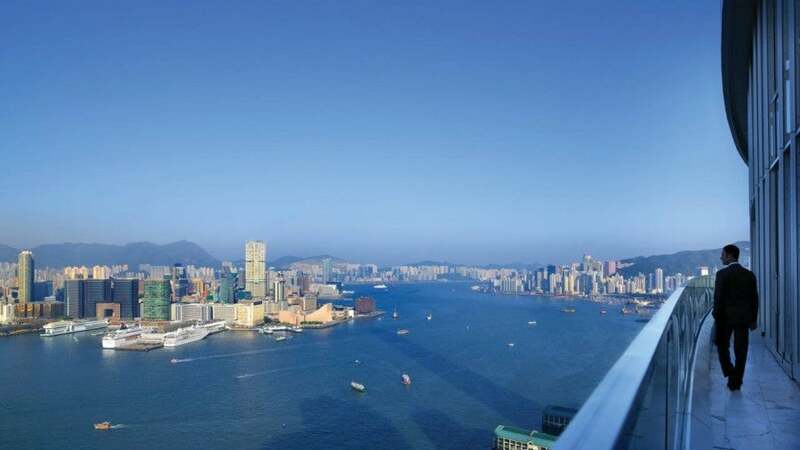 The Horizon Club at the Island Shangri-La Hong Kong includes numerous added amenities and services. 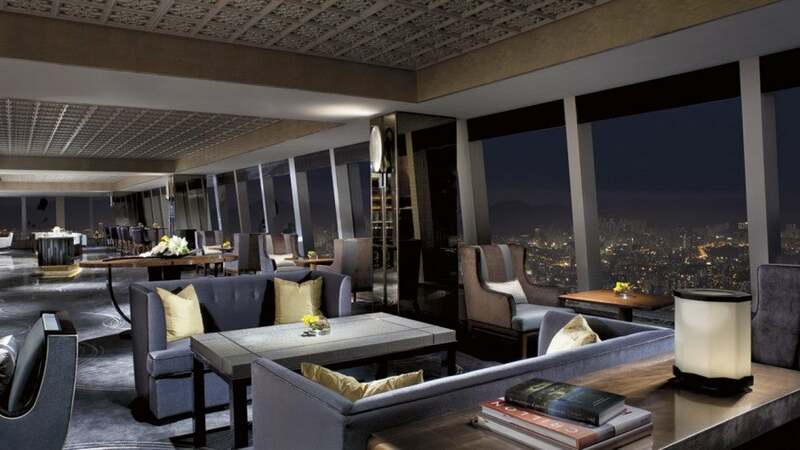 Another luxury property in the Pearl of the Orient with a fantastic club lounge is the Island Shangri-La Hong Kong. From the Horizon Club, set high above the city with views of the skyline (and Victoria Peak from the adjoining outdoor garden), you can take advantage of free Wi-Fi, suit pressing and shoe shine services, and meeting facilities for up to two hours per day. Breakfast is served in the lounge or the adjacent Restaurant Petrus, and you’ll also enjoy all day beverages plus evening cocktails and canapes. A dedicated concierge can help with your travel and translation needs, and your choice of tea or coffee is delivered to your room with your wake-up call each morning. How to access: Standard rates in January start at HKD 3,700 (US$477), with club rooms priced at HKD 1,000 more per night (a premium of approximately US$129). Shangri-La also has its own loyalty program, Golden Circle, and you can redeem 7,125 points per night for a standard room or 9,800 points for a club room. This hotel is also a part of American Express Fine Hotels & Resorts, so you could hope for an upgrade to the club level. The club lounge at the Ritz in Hong Kong isn’t just about the view from 1,500+ feet above sea level. Yet another top hotel lounge found in Hong Kong (notice a trend?) also happens to be the highest on the planet. Rooms at the Ritz-Carlton Hong Kong occupy the top 16 floors of the International Commerce Center. The Club Lounge is located on the 116th floor, which stands approximately 1,525 feet above sea level, or over a quarter of a mile! Enjoy six different (and extensive) food and beverage presentations daily, and take advantage of complimentary limousine drop-off service within the vicinity of the hotel. How to access: Unlike the Ritz-Carlton in Singapore, this hotel does participate in Ritz-Carlton and Marriott Rewards, and a free night will set you back 70,000 points per night (though this won’t get you club access). Standard rates in January start at HKG 4,800 (approximately US$618), and adding club access will typically set you back at least an additional HKG 1,400 (US$180) per night. This would actually be a great use of the club upgrade certificates offered by the Ritz-Carlton Rewards Credit Card, which is currently offering a sign-up bonus of 140,000 points after you spend $3,000 on purchases in the first 3 months. While you can’t use these certificates on award reservations, you could book a paid stay of up to 7 nights and upgrade to the club level for free. 7 nights of club access would be worth approximately US$1,262.50! This property is also a part of American Express Fine Hotels & Resorts. Though TPG decided to stay at the St. Regis and W on his recent trip to Bali, neither of those properties offer club lounges. Fortunately, many other properties on the island do, and one of the most popular is the InterContinental Bali. When you book a club room, suite, or villa at this resort, your vacation will commence as soon as you arrive at Denpasar International Airport, as airport transfer service is included with your stay. The Club InterContinental Lounge is actually like a mini resort within the resort, as you have a private wing of rooms and separate pool reserved for club guests only. You can also choose from five different venues in which to enjoy your complimentary breakfast, and the 24-hour lounge serves complimentary all-day refreshments, including afternoon tea and evening canapes & cocktails. Reserve a club room at a revenue rate. This will generally set you back at least $100 extra per night. Rates in January start at $161 per night, and club rooms begin at $266 per night (though the premium is higher during peak travel periods). Reserve a reward night (35,000 points) and inquire ahead of time (or at check-in) about paying to upgrade to a club room. I’ve read reports of upgrades being offered for $100-$120 per night—essentially the same up-charge as paying for the club room. Note that I don’t see any award availability for the month of January. The InterContinental Bali is also a part of Visa Signature Hotels, so you could book a room through them and hope for an upgrade to the club level (though it’s not guaranteed). Enjoy spectacular panoramic views of Sydney Harbour from the club lounge at the InterContinental Sydney. Another InterContinental property (this one in Australia) makes this list due to it’s wraparound terrace and panoramic views. At the InterContinental Sydney, the 32nd floor Executive Lounge boasts impressive vistas of the Sydney Harbour (including the iconic opera house and bridge). Take advantage of complimentary breakfast, all-day refreshments, and evening drinks & canapes. As a club guest, you’ll also enjoy complimentary internet and garment pressing services (one item per day). This is a great option for those without children, as guests 12 and younger are not allowed in the lounge after 5 pm. How to access: Like the InterContinental Bali, this property does participate in the IHG Rewards program, but doesn’t give you an option to redeem points for a club room. A standard room will set you back 50,000 points per night, and according to the property’s FlyerTalk thread, Royal Ambassadors appear to have the choice between an upgrade to a club room or suite (with no club access). You also have the option to simply pay for a club room; unfortunately, this comes with a hefty price tag. Standard rates in January start at AU$299 per night, with club rooms generally commanding a premium of at least AU$150 per night. Another option is to book through the Virtuoso network. For 2014 and 2015, all reservations made through a Virtuoso agent include complimentary club access. 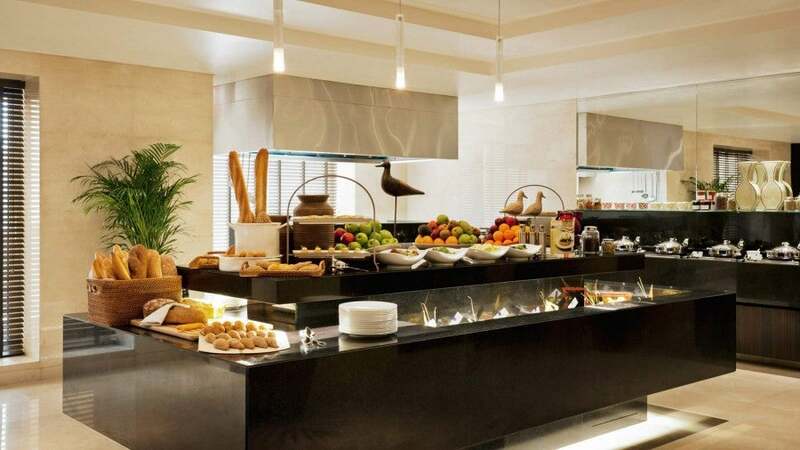 Enjoy an impressive spread of food and beverages throughout the day in the Level 5 lounge at the Grosvenor House Dubai. Dubai is known for its bling, but Level 5 at the Grosvenor House (a Luxury Collection property, part of Starwood Preferred Guest) blends elegance and sophistication in an understated fashion. Enjoy views of the Dubai Marina as you indulge in a full buffet breakfast, afternoon snacks & tea, and evening cocktails. With three separate lounge areas (only one of which is accessible to guests under the age of 16), you can easily find a quiet spot to read (a selection of books are provided) or catch up on work (with complimentary internet). How to access: The lounge is available to SPG Platinum members on either paid or award nights; standard rooms will set you back 20,000 points per night, and January rates begin at 840 AED (about US$229). You could also simply pay for a Premier Room, though the paid rate is almost double that of a standard room. 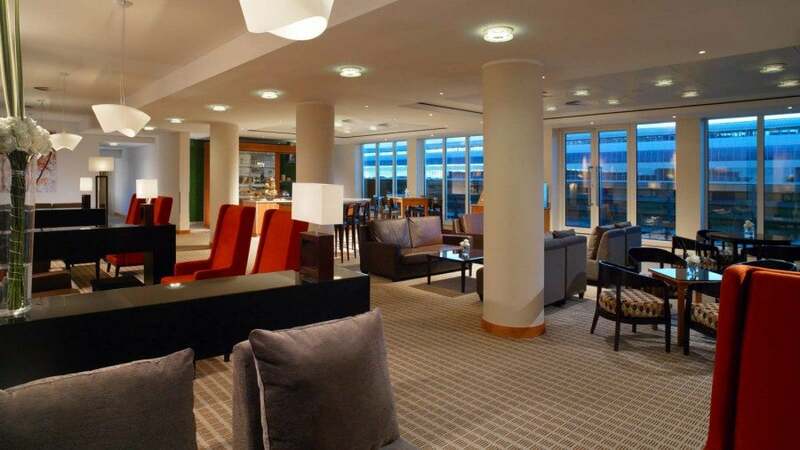 The roomy lounge at the Sheraton Frankfurt Airport is proof that an airport hotel isn’t just about the location. This SPG property may seem like a surprise inclusion on this list. However, the Sheraton Frankfurt Airport provides much more than just a convenient location (it’s literally attached to FRA). The spacious Club Lounge is located on the ninth floor, and includes an impressive array of amenities, including buffet breakfast and a variety of hot and cold snacks and drinks until 10:30 pm. You can also use the complimentary high speed internet or book one of two board rooms, with meeting space for up to 8 people. How to access: Club access is complimentary to SPG Platinum members on both paid or award stays. As a Category 4 property, free nights will set you back 10,000 points, or you can book SPG Cash + Points rates for 5,000 points + $75. Standard rates in January start at 135 Euros (approximately US$164), and booking club rooms directly appears to be a standard premium of 99 Euros (~US$120) per night. Alternatively, you can pay that same 99 Euros for day use of the lounge without an overnight stay. 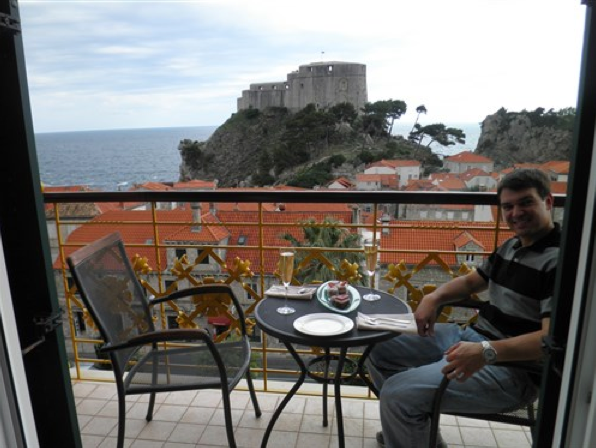 Enjoying some canapes and a glass of champagne on the balcony of the Hilton Imperial Dubrovnik. Our final lounge is also located in Europe, and while the amenities may not equal those offered by a Four Seasons or Ritz-Carlton, the Hilton Imperial Dubrovnik offers a fantastic lounge for the location and views alone. Book an Executive Room to take advantage of all of the lounge benefits, including free breakfast, complimentary snacks and drinks, and a cozy balcony with views of the Adriatic Sea and the old town of Dubrovnik. The city walls are practically spitting distance from the lounge, giving you a terrific location to explore the wonders of the ancient city. NOTE: According to the hotel’s website, the lounge is currently undergoing renovations and has been relocated to the ground floor until March 31, 2015. How to access: Hilton Honors Diamond members are automatically granted access to the lounge on both paid and award stays. Gold members (including Citi Hilton Reserve and Hilton Honors Surpass Card from American Express cardholders) can access the lounge if they receive an upgrade to the executive floor. Paid rates in January are as low as 90 Euros (US$109), with Executive Rooms going for a premium of 33 Euros (US$40). As a Category 8 property, award stays will cost 40,000 or 70,000 points per night (depending on the month). Hilton Honors also offers “Premium Room Rewards” that allow you to book directly into an Executive Room for a small premium over the standard redemption rates, and sometimes these are even lower, so be sure to check your desired dates for the specific points requirements. Everyone has their own criteria for what makes for a solid hotel club lounge; the ones featured here offer a mix of useful perks, style and comfort, and impeccable location that put them at the top of my list. I’d love to hear your ideas, so please share your favorite hotel club lounges in the comments below!